French President Macron has been acting very odd during the commemorations of the end of World War I which were held in Europe recently. He called for a European army and likened the USA as posing as big a threat to Europe as Russia or China. Macron wants a “real European army” and likened “nationalism” to leprosy” (first link). That last comment is clearly an insult to US President Donald Trump, who is a leading nationalist, as well as to various European heads of state who are strong nationalists. Macron’s insistence that the USA is as big a threat to Europe as Russia or China is a huge insult to all Americans and all the nations of the British Empire that saved France in two world wars. The only reason Macron can even serve as the head of state in an independent France is that the USA, Great Britain, Canada, Australia, etc. were willing to lose many lives and spend immense sums of money to rescue France and the rest of Europe from the dominion of the Nazis. Macron seems breathtakingly clueless to the negative impact his bizarre statements would have on many people in many nations. In the second link and third link, Macron’s Finance Minister echoes Macron’s assertions and even added that “Brussels [i.e. the EU] should be an empire” as the Chinese Empire. Macron has made bizarre statements ever since he came to power in France. Soon after he was elected, he declared that he would reign over France like the god, “Jupiter,” who was “king of the Roman gods” (fourth link). He even summoned the French Parliament to behold his glory as he took on the physical trappings of a Medieval king of France. I think it is clear from these statements that Macron is calling for the EU to be an “empire” in order for Macron to serve as its emperor. Hmm. Macron seems to exhibit at the very least a Messianic Complex for himself. Has he read Matthew 24:3 that prophesies a coming messiah shall be called Emmanuel (or Immanuel)–which is Macron’s first name? That prophecy obviously foretells that Jesus Christ will be the true Messiah, but Matthew 24:24 warns that “false Christs” shall come forth as pretenders in the latter days. Does Macron consider himself a messiah? Daniel 11:35 begins a prophecy pertaining to the end times of our age, and verse 35 foretells that a dangerous “king” [a chief of state in our modern terminology] will appear on the world scene who will “magnify himself above every god.” Hmm. Macron openly declares he is like Jupiter who reigns over all the gods. Macron’s self-glorification comes very close to fulfilling the prophesied attitude of the dangerous “king” in Daniel 11:35. Macron bears watching from a biblical prophetic point of view. 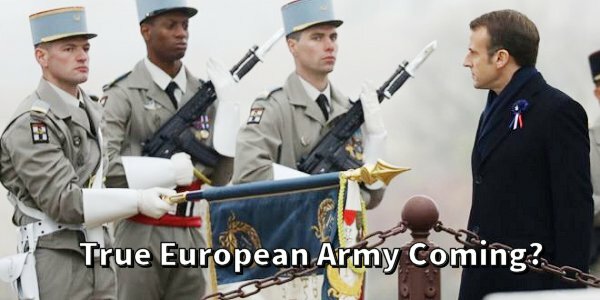 The aforementioned links also detail specifics about Macron’s call for the EU to become an “empire.” France currently is the leader in what is becoming a ten-nation grouping of nations out of which Macron hopes to form his desired European army. The fifth link also warns that Macron’s proposal reveals that there are “deep…rifts” developing between NATO and the EU. The French-led grouping has ten nations now that Finland has joined it. However, it is very likely to drop to nine when the United Kingdom leaves the EU in whatever form its Brexit process takes. A recent post of mine about Europe’s non-NATO military alliances (sixth link) details not only the French-led grouping but several others as well. Many European nations are in either NATO and/or several of these other alliances. I think the only reason Finland is a member of the French-led group instead of NATO is that NATO has real power and Russia had issued dire warnings to Finland if it joined NATO. Russia has issued no such warning to Finland about joining the French-led group because it knows that group currently possesses no real power. I urge readers to review the sixth link as it details some interesting dynamics about what nations naturally are joining together in back-up alliances if NATO dissolves. You will notice that the Scandinavian and Baltic nations tend to be members of any alliance which links them to the USA and the more powerful nations of Europe. There is one grouping headed by the UK, another by Germany and the one led by France. NATO is unquestionably led by the USA. One can foresee a situation where the nations of Europe will need to “choose sides” to align themselves with whatever alliance will give them the most security. Eastern Europe has already chosen to be aligned with the USA. Romani and Poland are hosting American Aegis Ashore air and missile defense systems and Poland has proposed spending $2 billion of its own money to build an American military a base on Polish territory. Soon after he was elected, President Trump was welcomed by the recently-formed Three Seas Initiative group-which is composed almost entirely of former nations who were oppressed by the Russians in the old Soviet Union. What the choice boils down to for many European nations is “Who can protect us from Russia?” Can Germany do it? Obviously not. Can France do it? No. It can barely defend itself. The alliance proposed by France so far exists only “on paper,” and offers no actual security to its proposed members. Macron wants a globalist “empire” of European nations (under Macron’s royal leadership, no doubt), but his own proposals could help break apart the EU itself. There is a very true statement in Luke 16:13 that no one “can serve two masters.” European nations cannot devote their limited military forces to both the NATO and an alternative EU/French command structure. That is clumsy and simply won’t work in practice. Macron’s proposal for a French-led European army independent of the USA resulted in quick push-back. The seventh link contains the head of NATO warning that European military forces should stay in the NATO command structure. A retired American general panned Macron’s proposal as well (eighth link). President Trump reacted swiftly and very critically to Macron’s proposals to abandon US leadership of Europe’s defense (ninth link). The ninth link also draws attention to a huge problem for Macron. He is immensely unpopular in his own nation and his poll numbers are among the lowest of any current head-of-state. Macron likely could not win an election in his own nation at present. Also, Hungary’s President Orban was dismissive of Macron’s proposals (tenth link). Orban is a leader in the bloc of European nations who are led by nationalist/populists, and they are likely to recoil from Macron’s call for any European “empire” led by Brussels (the EU Bureaucrats). Any such Brussels-led empire would mean that all the other nations of Europe would lose their national sovereignties and would be reduced to mere provinces of this new “empire.” That is a very unpopular message in modern Europe. It seems that Macron would like to lead Europe, but Europe does not want to follow him. At the very least, the imperial pretensions of Macron and his Brussels-based EU allies are now out in the open for all to see. It will be very interesting to watch how all this unfolds in the future. Whatever happens, will almost surely have biblical prophetic implications. For in-depth, biblically-based, prophetic perspectives on modern geopolitics, please read my free articles, Are We Living in the Biblical Latter Days?, Is Babylon the Great about to Fall…Ushering in a New Beast System? and The USA in Biblical Prophecy.